Whenever I find cheap flights, it’s cause for celebration. And I celebrate a lot. Of course, there are reasons why you may not always opt for the cheapest possible ticket to get from point A to point B. At the end of the article, I’ll discuss some of those. You should read that section, because it could effect your overall miles-gathering strategy. But first, here’s an easy step-by-step guide to finding cheap airfare. I’m traveling just about every time my schedule and bank account allows me, and I work a regular 9-to-5 in an office. That means I’m constantly on the hunt for cheap flights. Here’s my exact step-by-step process. I have it down to a routine, and you soon will too. In fact, with enough practice, you’ll find cheap flights with so much regularity, some of the prices you’ve paid in the past may start to look foolish. But don’t worry. It’s all part of the learning process, and the Wild Blue Yonder isn’t going anywhere. STEP ONE: Put your browser in incognito mode. Big brother is everywhere in the digital age. That includes the flight searching history stored in your internet browser. Booking sites and airlines both will increase prices on flight routes that are repeatedly searched in small time windows. They want to try to get you to book right away, and thus create the specter of an imminent price increase if you hesitate for an hour or two. The way to beat this trick? Put your browser into “private” or “incognito” mode. This mode washes your browsing session clean of cookies accumulated prior, and doesn’t store cookies you otherwise would have gathered while clicking around ticket sites. That way, booking sites will treat you like a new customer on each visit, and your cookies won’t contribute to the volume of searches for particular destinations that airlines use to aggregate demand and increase prices. BONUS TIP: have your traveling companions do the same. If you’re searching in incognito mode, but your friend downtown is looking for the same flights, for the same days, at the same departure airport as you, then it’s still feeding the airline’s algorithm and hurting your chances of finding the lowest fare. STEP TWO: Get on Twitter. There are several fantastic Twitter accounts that use a combination of algorithms, bots, and good ol’ fashioned human curating to post steady streams of rock-bottom flight deals. 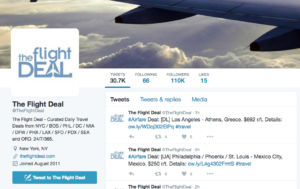 The Flight Deal – my favorite Twitter account for deals. They always note the airlines providing the deal and provide great coverage for all 12 major US air hubs. They operate on weekends and holidays. They publish a deal every 20 minutes or so. Can’t beat it. Time Zone Agnostic – self promotion level: shameless. I don’t put out the volume of deals that these other guys do, but I do publish all the goodies I find, usually for the greater NYC area (JFK, LGA, EWR, and PHI). If you’re in the neighborhood, give me a follow. Airfare Watchdog – similar to the Flight Deal and just as prolific. They also seem to nail the odd error fare and/or fuel dump from time to time, which can be a huge win. BONUS TIP: Set up a feed. Use a tool like Hootsuite or Tweetdeck (both free) to automate your search by setting up feeds for all the above named accounts, plus search strings like “flight deal [your desired destination]” or “flight deal [your airport of choice]”. Open up this feed in a tab in your web browser and leave it running in the background all throughout your workday. It’s inconspicuous enough that you can hide it should your boss come strolling by, but convenient enough that you can peek at it during coffee breaks to see any breaking deals. The thing with cheap airfares is, they go fast – we’re talking a 24-48 hour lifespan for most good deals – so using an automated Twitter feed can really boost your odds of snagging the ticket you want. STEP THREE: Know the real story behind the cheapest day to fly. 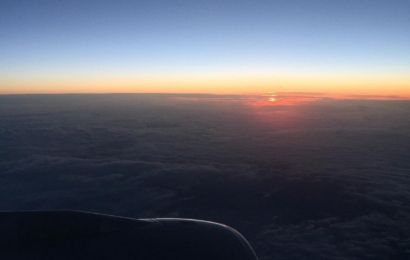 There are a ton of myths and misinformation surrounding the cheapest day to book a flight. One of the more popular ones says that you need to book on Tuesdays at 3:00pm. This is not true. At least, it is no longer true enough to be considered a hard ’n fast law of the universe. Instead, keep these (fairly obvious) factors in mind: more people fly on weekends, in the summer (locally defined), and 1-2 weeks in advance of major holidays/festivals/sports events than any other times. More people flying means higher fares. So, while your chances of finding a cheap flight on a Tuesday are little better versus the following Wednesday, finding a cheap flight to Munich two days before Oktoberfest will be tough, regardless of whether you book on Tuesday, Wednesday, or Saturday. STEP FOUR: Be flexible with dates. Often times, it can save you cash to have between 1 and 3 days of flexibility in your arrival/departure dates. And many booking sites, like Booking.com, let you build in a leeway of 1-3 days when you search for flights, so you can compare all your options at once. What If you do need to book a flight during a peak travel time? Let’s say you want to book that trip to see Oktoberfest and down a stein or two of genuine pilsner. Normally, you’d plan to land in Germany just a day or two before the start of the festival, or even while the festival is going on. But before you book, ask yourself: what are my per-diem accommodation costs? How much cheaper would it be to book a flight a week or even two weeks ahead of the event I want to attend? Would the added accommodation costs add up to more than the cost of the more expensive flight closer to the event date? This simple equation could potentially save you a couple hundred bucks – especially if you’re staying for cheap, like at a hostel or crashing with a friend. STEP FIVE: If you’re booking for a group, search for single tickets at a time. If you have your heart dead-set on flying together with all members of your traveling party, then by all means, skip this step. But first, let me try to talk you out of that. There’s very little reason to want to fly with your friends. A plane is not a good place for hanging out and catching up. An airport isn’t much better. Chances are, if you’re booking cheap flights to accumulate frequent flyer miles, you may have a redeye overnight flight where you’re going to want to sleep as much as possible anyway, so conversation and friendly banter will be a non-starter. If you book your tickets separately and just plan to rendezvous once you’re all in country, you can save a healthy chunk of change. The reason is because airfare algorithms know there are some groups (families with small children, tours, etc.) who have no choice but to book seats together. So they charge higher prices for tickets that are searched and booked as part of large groups. To avoid the hike, have everyone in the group book individually. STEP SIX: If a layover is necessary, consider booking individual flights yourself. Often times, the cheapest route from A to B actually involves a stop in C. Flights that include a layover in an airport before landing at your final destination are often cheaper than their direct-flight counterparts. This is yet another offshoot of the “most people hate airports and will pay a premium to minimize time spent in them” market inefficiency that you, as someone who is both thrifty and enjoy airports, can exploit. You might be transferring in an airport that serves as a hub for a different airline with cheaper routes to your final destination. For example: if Philly is a hub for British Airways, which would have cheaper daily service to London than LAX, you could save by booking a British Airways for your trans-atlantic flight – even if you didn’t fly British Airways from LAX. Second, you can sometimes book a second flight that is a day or two longer than a normal transfer, and thus end up flying on a day when costs are cheaper. This is a version of Step Four above – sometimes a ticket’s difference in price from one day to the next can be significant, so you might hit big savings by adding some date flexibility into your transfer. The caveat here, of course, is that you have to find a way to kill a day or two in your transfer city. You could find a cheap AirBnb, stay with a friend, or – if you’re really a die-hard – try to wait it out in the terminal. More on how to do this in an upcoming TZA post. STEP SEVEN: Check all of a country’s airports for the cheapest landing. Don’t ask me why, but when it comes to Italy, flights to Milan are almost always cheaper than flights to Rome. Italy is a small enough country that it’s totally feasible to plan a vacation in Rome, but fly into Milan and utilize much cheaper ground transportation or local, regional airlines to travel once you’re in Europe. Again, most people dread the idea of adding complexity to their travel plans, so they’ll pay a premium to streamline things – but you, TZA reader, are not most people! You recognize that the journey and the destination are one in the same, and you can grasp that a train ride through scenic Italy is an incredible way to spend an afternoon. So, always click around and find a country’s cheapest airport, especially if that country is small, i.e. European. STEP EIGHT: Use the absolute best flight search engine: all of them! When you’ve considered all of the above and are finally ready to book, how will you know which search engine to use to find cheap flights? Kayak, Skyscanner, Google Flights – with the myriad options available but only 24 hours in a day, how do you know which to pick? Here’s the short answer: use all of them. 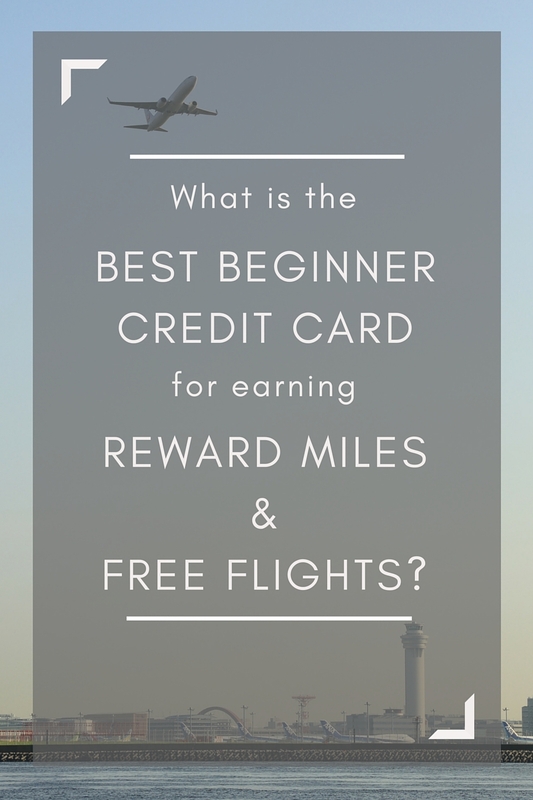 Here’s the long answer: use as many as you can, and check at least three or four before you slap your airline miles rewards credit card down on the proverbial counter. Even though some, like Kayak and Google Flights, purport to compare results between many different sites (Priceline, Booking.com, etc. ), they each have gaps and blindspots. Pour a fresh cup of coffee, give yourself a couple hours, open a spreadsheet, and get to researching. BONUS TIP: Hit a fuel dump. There is a ton of buzz about the elusive art of fuel dumping. It would take another post to fully explain the how-to of fuel dumping…so I’m writing one! Just to tease you, I will mention that I have successfully used fuel dumps on several occasions – including to book a $250 round trip ticket to Paris for New Year’s Eve this year – so the power is real. Stay tuned. Discount tickets are usually booked into a different fare code than their full-priced counterparts. Most major airlines don’t reward passengers in these fare classes with as many behind-the-scenes perks. 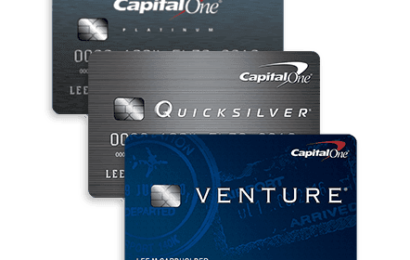 For example: American Airlines requires many, many more award miles and usually a cash fee to upgrade a discount ticket from coach into business or first class. I recently flew a short haul domestic from JFK to STL and figured I could bag an upgrade for 5,000 of my AAdvantage award miles, per American’s upgrade chart below. However, I failed to realize that my ticket was booked in a discount fare code – so I would have actually had to use a whopping 15,000 miles plus a $175 fee. (It ended up not being worth it as I got a day-of-flight upgrade for $90 anyway. Bottom line: it’s worth it to know a little bit about fare codes if you’re interested in upgrading to business class. If you have to be in a certain city at a certain day and time, like for an event, business meeting, trade conference, concert, sports match, or whatever – you may have to sacrifice bagging the cheapest fare in favor of the one that gets you from A to B on time. As discussed elsewhere on Time Zone Agnostic, flying as much as possible on a single airline is the sure-fire way to gain elite status and maximize free award flights. Sometimes, this loyalty comes at the price of, well, higher price. The good news is, flights to the same destinations on the same days but on different airlines are rarely all that much different in terms of price. I compare a lot of flights every day, and tend not see deltas of more than couple hundred bucks. Of course, $200 isn’t chump change – but when you’re paying $1,300 for a round-trip ticket to the Far East, the difference becomes a little less painful. * P.S. : I don’t include several popular tactics for finding cheap flights here: namely, budget airlines (Spirit / Ryanair / Norwegian) and “hidden cities”. Why? I think budget airlines are generally not worth the risk of delay, cancellation, lost baggage, and lack of award miles. 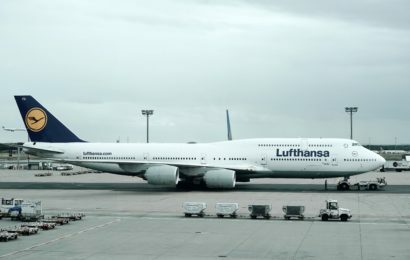 The ethos of this blog entails an embrace of flying and airline culture, and budget airlines tend to shun most of that in favor of saving a nickel here and dime there. Re. hidden city ticketing, I counsel against it because of the risk of getting caught and having your tickets cancelled, or even getting banned from the airline. If you’ve spent years building a respectable mileage account with an airline, the last thing you want is to get booted and have to kiss all that hard work goodbye. But, if you are so inclined, Gary Leff has a typically excellent how-to guide.